University of Utah • Fight song's lyrics very close to those of "My Name is Sigma Chi." 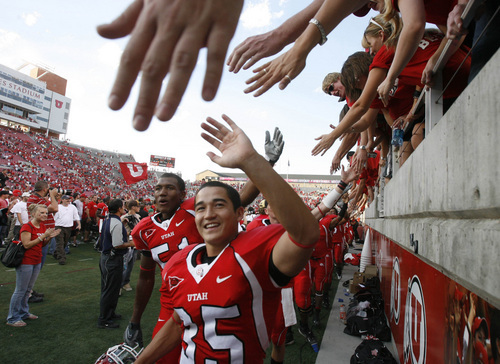 Rick Egan | Tribune file photo Kicker Louie Sakoda high-fives fans after Utah beat UCLA 44-6 at Rice-Eccles Stadium in 2007. 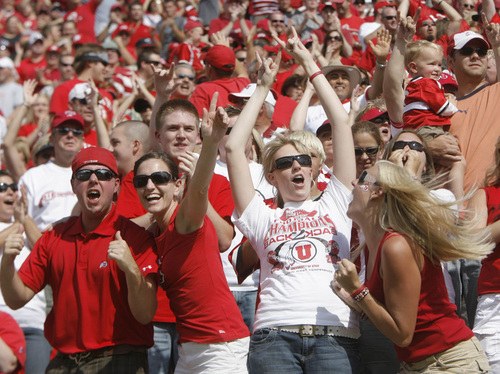 Rick Egan | Tribune file photo Utah fans celebrate early on as the Utes take an early lead against UCLA in 2007. 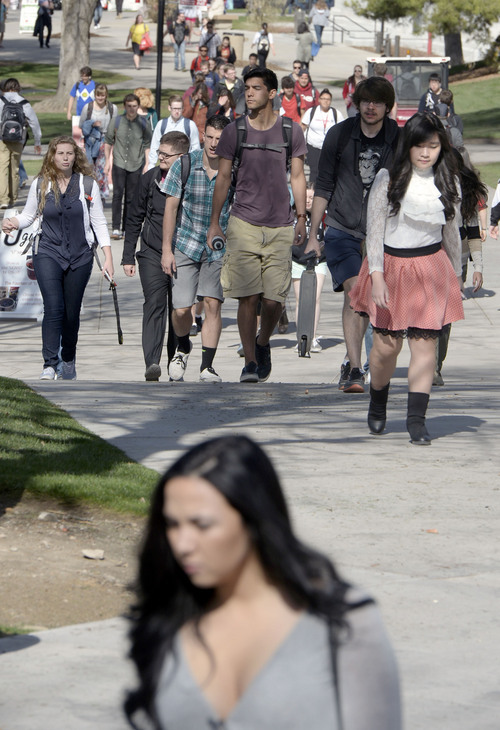 Al Hartmann | The Salt Lake Tribune University of Utah students head to class on April 8. Thestudent government on Tuesday, April 22, 2014, voted to urge university administrators to change lyrics for the school's fight song, "Utah Man." Some lyrics of "Utah Man" can be considered sexist and racist. 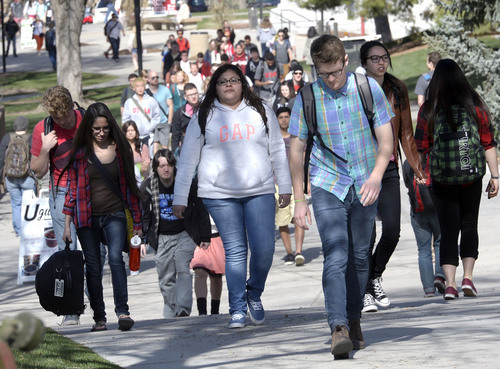 Al Hartmann | The Salt Lake Tribune University of Utah students head to class on April 8. 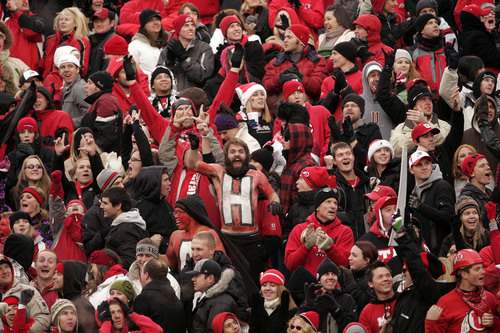 The student government on Tuesday, April 22, 2014, voted to urge universityadministrators to change lyrics for the school's fight song, "Utah Man." Some lyrics of "Utah Man" can be considered sexist and racist. 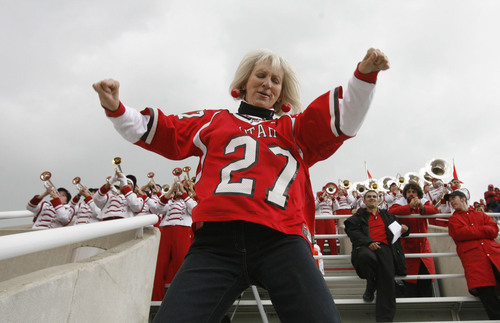 Rick Egan | Tribune file photo "Bubbles", who fans sometimes call the "Crazy Lady", dances in the south bleachers between the 3 and 4th quarter during of a game against San Diego State in 2007. Tribune file photo The original caption on this 1948 photo says: "Just before the big game bandsmen gather with Director Ronald D. Gregory for skull practice. Left to right are Gerald Epperson, Bill Rokes, Kenn Millard and Lee Wright, all of Salt Lake, with Drum major Bill Rhead." Trent Nelson | The Salt Lake Tribune John Smith, the infamous "H Man", and other Utah fans celebrate as the Utes face BYU at Rice-Eccles Stadium Saturday, November 27, 2010. 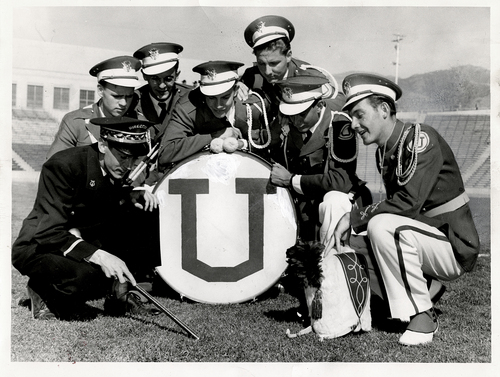 The controversial University of Utah fight song looks to be closely based on an old fraternity song. A history of "Utah Man" collected by the U.&apos;s Marriott Library is unclear on the song&apos;s authorship, at one point theorizing that fraternity brothers may have written it in response to a 1901 song contest sponsored by The Daily Utah Chronicle, since a fraternity song and "Utah Man" are both set to the folk tune "Soloman Levi." But others said the writer was early-1900s football coach Joe Maddock. "There&apos;s always been two speculations, that it was either the football coach, then there was always a thought that it did come out of the fraternity, but we could never really substantiate that, exactly," said Marriott Library archivist Clint Bailey. Despite at least two copyright inquiries, it doesn&apos;t look like the U. ever tried to copyright the song, and it doesn&apos;t appear administrators were aware that it tracked the Sigma Chi song so closely. "We&apos;ve spent quite a bit of time looking into this stuff, but that doesn&apos;t mean we didn&apos;t miss something," Bailey said. The lyrics to the fraternity song are almost identical aside from the name of the fraternity, its colors and the signature yell. "My name is Sigma Chi" is one of about 40 songs posted on the Sigma Chi website, which says it was written by Charles H. Eldridge in 1885. The Sigma Chi song also contains the line: "Oh we drink our stein of lager and we smoke a big cigar," which was part of "Utah Man" until the middle of the past century, when it was changed to "our coeds are the fairest." That line, though, could now change again. Student and faculty government leaders called on U. President David Pershing last month to make the words more inclusive. Pershing agreed to consider changes, and a school committee is taking public comment at the email address fightsong@utah.edu through Saturday. The panel is expected to recommend potential updates by the end of June. Our yell, you hear it ringing thro&apos; the country near and far. Sigma Chi, sir, will be till I die. Hey! The Blue and Gold forever, I&apos;m a loyal Sigma Chi! Hey! With parting breath we&apos;ll sing the praise of good old Sigma Chi. Our coeds are the fairest and each one&apos;s a shining star. Who am I, sir? A Utah man am I; A Utah man, sir, and will be till I die; Ki!Yi! "A Utah Man Am I".